CORONADO, Calif. (AP) — Like a Hollywood star, Coronado's 1.5 mile-long beach literally sparkles, thanks to the mineral mica glinting in its sand. That's one of the reasons why Coronado — flanked by the iconic hotel featured in Marilyn Monroe's 1958 film "Some Like It Hot" — has been named the No. 1 beach in the United States in the 2012 survey by "Dr. Beach" professor Stephen P. Leatherman of Florida International University. 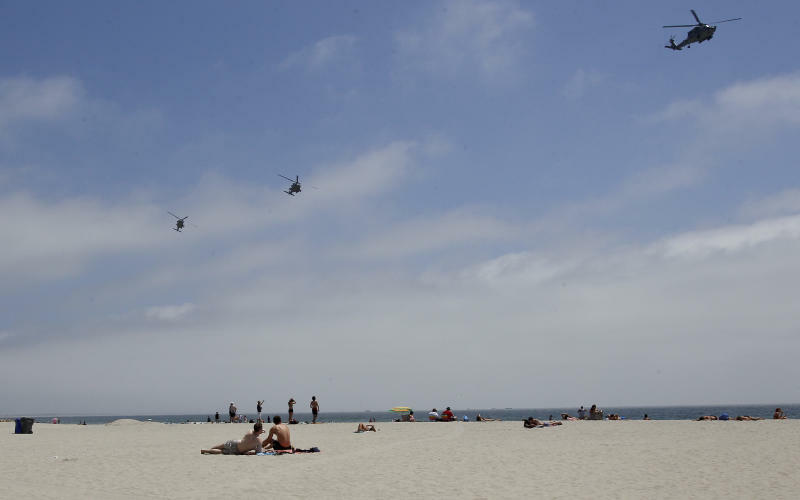 It is the first time "Dr. Beach" has given the top slot to California in the more than two decades that he has been ranking beaches in the United States based on their environmental quality and safety for swimmers. Coronado Beach, on a peninsula across the bay from San Diego, has near-perfect Mediterranean weather and a postcard backdrop. "I think it's one of the most super beaches around," said Leatherman, director of FIU's Laboratory for Coastal Research. Rounding out the top 10 this year were No. 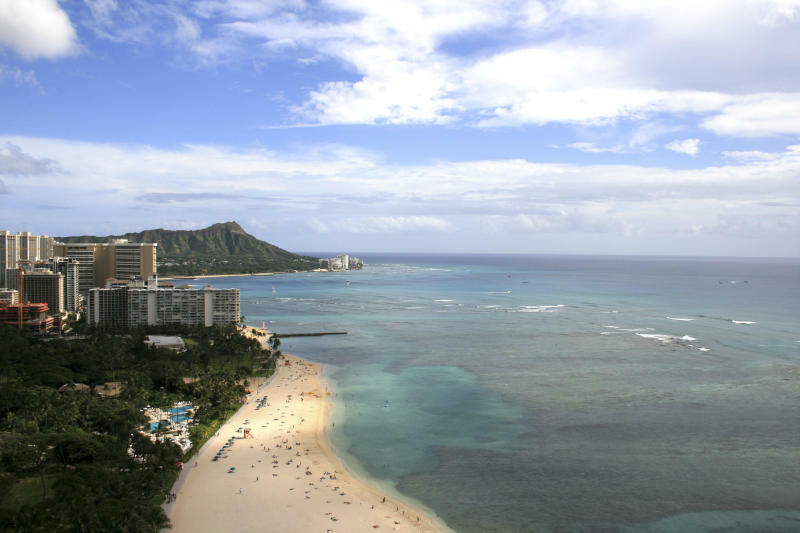 2, Kahanamoku Beach in Waikiki, Honolulu, Hawaii; No. 3, Main Beach, East Hampton, N.Y.; No. 4, St. George Island State Park, Florida Panhandle; No. 5, Hamoa Beach, Maui, Hawaii; No. 6, Coast Guard Beach, Cape Cod, Mass. ; No. 7, Waimanalo Bay Beach Park, Oahu, Hawaii; No. 8, Cape Florida State Park near Miami. ; No. 9, Beachwalker Park, Kiawah Island, S.C.; and No. 10, Cape Hatteras in North Carolina. Leatherman ranks beaches on 50 criteria, including the look and feel of the sand, water quality, weather, facilities and crowds. A top score is 250. Coronado came in the 230s, losing points because its water temperature hovering in the 60s allows for only a quick dip for most, Leatherman said. California's chilly coastal waters have cost its pristine beaches points when they've been up against balmy contenders in Florida and Hawaii in the past. Coronado Beach was runner-up last year to Florida's Siesta Beach. Once a beach tops Leatherman's list, it is retired from consideration for future rankings. A No. 1 spot on the popular list typically brings a 15-to-20-percent boost in visitors. Leatherman said Coronado is great for skim boarding (gliding on the water with a small, finless surfboard) and walking. The wide, flat beach is lined by majestic mansions and the Hotel del Coronado. Known as "Hotel Del," the National Historic Landmark with its peaked red roof was built in 1888 and is the last of California's Victorian seaside resorts. Coronado is also the name of the swanky-yet-quaint city on a peninsula populated by Navy officers and some of California's wealthiest. It can be reached by ferry boat for a few dollars from downtown San Diego. There is free parking at the beach but it is on a public street so it can be challenging, Leatherman said. On a recent spring afternoon, tourists from China to Russia sprawled out on its beach in front of "Hotel Del," lounging on blankets in the sun. A Navy ship dotted the horizon. One man aimed his camera upward, thrilled as the quiet lapping of waves was interrupted with the roar of a Navy jet from a nearby base doing a training exercise. 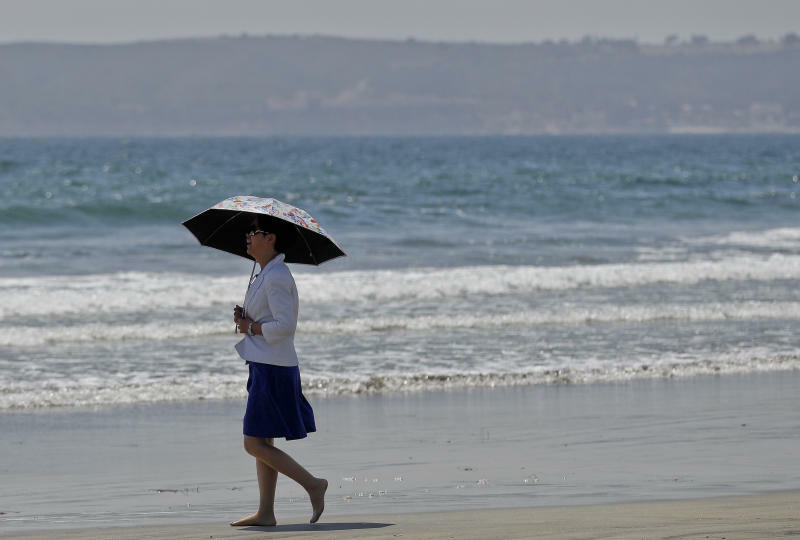 Lifelong San Diego County resident 55-year-old Nellie Landeros said it is her favorite beach. "It's gorgeous," she said. "Just the setting alone feels like we're in another world." Billy Pavlacka, 51, has been visiting Coronado Beach weekly for 30 years. Known as "The Sand Castle Man," Pavlacka was building a towering castle with rows of arches and spheres. He said he spotted an aircraft carrier and submarine earlier that day. Flecks of the glittery mica mineral make the sand shimmer in the sunlight. "If you look at the sand you can see it sparkling," said a tanned Pavlacka, with gray locks peeking out from under his baseball cap. "People ask me all the time if it's gold." The top 10 list is in its 22nd year. Beaches do not pay to be evaluated for the top 10 best beaches list. Leatherman said he visits top 10 candidates incognito to collect sand and water samples for study.